Explore the many fields in which brands are using VR content and 360Â° photos to distinguish themselves. Highlight what makes 360Â° virtual content unique both as a marketing tool and as an art form. Demonstrate the longevity of VR and 360Â°. Interactive content, like 360Â° immersive media, is widely applicable, versatile, and extremely successful. From interactive ads to promotional brand videos (like the one Columbia Sportswear created), immersive media is changing the way people engage online and relate to the world around them. What is 360Â° and VR Content? 360Â° content is similar to the traditional photo and video media weâ€™re all familiar with. The primary difference is that instead of limiting your view to the frame of your desktop or mobile screen, 360Â° content allows participants to explore an immersive 360Â° space at their own pace. The difference between VR and 360? 360Â° content is like sitting in the seat of a race car. You can look in any direction at whatâ€™s going on around you (from a fixed POV), and click on objects and interact with other media forms embedded into the 360Â° space. With VR, your perspective isnâ€™t always fixed, and VR experiences are often viewed & interacted with using a VR headset where you can walk around inside the world. 360Â° photos, graphics, and videos can be viewed using a VR headset but are, more readily, experienced on desktop and mobile phones. 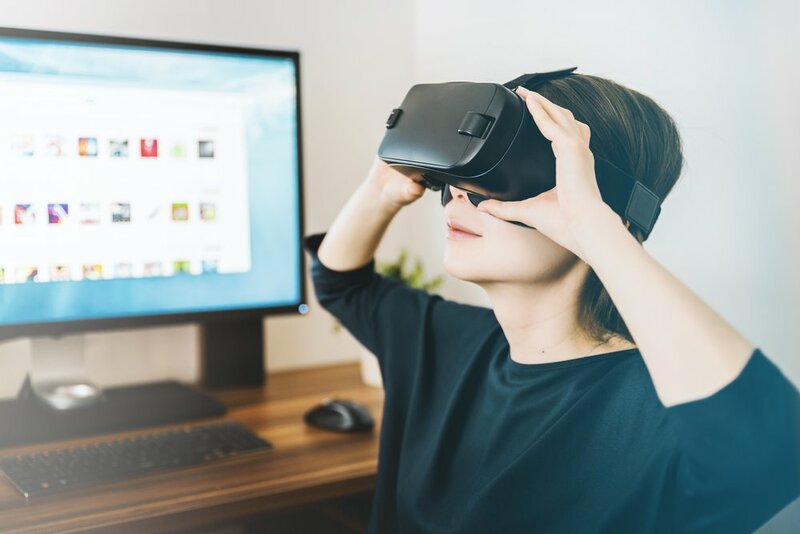 Terminology aside, both VR and 360Â° media are changing the nature of digital interaction and both are seeing incredible applications in marketing experiences. Who is Using 360Â° content? Currently, 360Â° virtual tours are most popular in real estate, for local businesses, museums, art spaces, and public spaces. (And many businesses are on Google Street View via 360Â° tours.) There are many other fields out there awaiting the Midas touch of 360. How will you incorporate VR and 360Â° media into your brand or personal aesthetic? Why Use 360Â° and VR content? Consider using this kind of content if you want to truly stand out. A business chooses this type of media because they value the direct engagement they can get with their market via 360Â° interactive content. As both a tool and an art form, 360Â° content increases brand transparency, integrates with social media campaigns, and bolsters content marketing campaigns. Plus, per the nature of being immersive, 360Â° and VR content educate audiences, encourage participation, and give people new experiences online. Note: A primary advantage 360s have over VR is accessibility. While VR headsets can deliver more compelling experiences, peopleâ€™s interactions with VR headsets are currently limited by the cost of headsets and the intensity of these VR experiences. With 360s, people can be similarly engaged with a new depth of space on their devices from the comfort of their armchair at home. and as part of a typical content mix. 360Â° photos offer a chance for unprecedented originality. From brand activations via designed 360Â° spaces to immersive photo advertisements in 360Â°, the possibilities here are as imaginative as the creative studio you work with. For example, we attended Durhams' Moogfest earlier this year and created dynamic 360Â° interview and live-performance pieces. We did the same for Beats N Bars hip-hop festival in Durham, too. And for Hopscotch the year before. There is a lot of clutter on social media. More than ever, businesses and artists need to create unique content to cut through the noise. 360 content offers a great opportunity to achieve incisive results. Interactive advertising (via 360) is more successful than passive, 2D ads, in terms of reach, clicks, engagement, and the ability to drive ticket sales to events. For an example of what this looks like, a Beaumonde hip-hop event client saw +800% increase in organic sharing on Facebook with the 360Â° event flyer we created for them. This is great news for marketers looking to reinvigorate their ad campaigns, get more for the same ad-spend, and to start conversations with audiences. P.S., 360Â° media drops jaws on mobile. 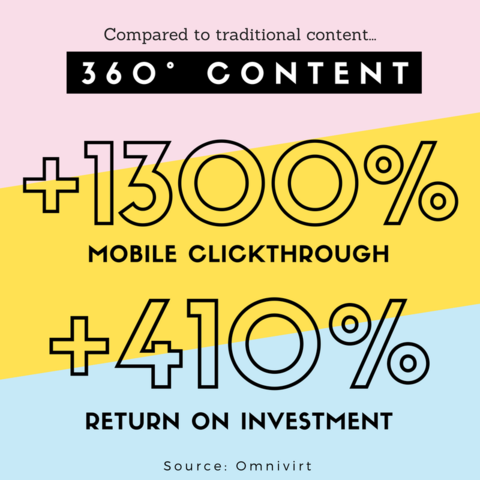 In comparison to traditional content, mobile click-throughs are going as high as +1300% for 360Â° content (Source: Omnivirt). I read in a LinkedIn article recently that â€œbelief-drivenâ€� consumers are on the rise. That people are increasingly interested in brands with transparent stances on sociopolitical issues, making a stand for what they believe in via their marketing campaigns, advertisements, and brand decision-making as a whole. Patagonia is a great example of one such brand. So is Lush. With 360 degrees of movement at the fingertips of expert creative marketers, brands can display their ethical underpinnings more clearly and allow people to get closer to the heart of their messaging. Brands can accomplish this a number of ways, one being 360Â° ads. Numerous studies have been conducted to see how people interact with 360Â° ads versus 2D ads. On the whole, 360Â° ads outperform 2D ads every time. We ran a 360Â° photo ad on Facebook for Ambleside Art Gallery (see above) and, compared to a similar 2D ad with the same ad-spend, we saw: 9x Photo Clicks, 1.5x Reach & Post Engagement, and 3.6x Page Likes. 360Â° interactive content offers further possibilities in how we engage with and remember experiences. Like going to hear your favorite hip-hop artist live in concert. With so many posts on social media, it is important to be able to share with potential customers the genuine pith of that which is advertised with greater clarity and speed. At the same time, while retaining authenticity. Interactive media offers a quickness, and clarity, of messaging; while also grabbing people's attention on websites and social media. In turn, proving highly compelling content that people want to share. According to an Ion Interactive survey, 88% of marketers said that interactive content is effective in differentiating their brand from their competitors. Additionally, 93% of marketers agreed that interactive content is effective in educating its buyers. As millennial spending on experiences increases every year, marketing campaigns for these experiences must adapt to stand out from the chattering crowds online. Itâ€™s becoming more important than ever to bridge the in-person experience with what potential fans and customers are seeing online. 360Â° content seamlessly bridges the gap between the in-person experience and the screen. In fact, when viewing immersive content our brains store these memories in first person. This gives 360Â° content a leg up on traditional content, resulting in a more memorable experience because of a deeper and naturally more engaging interaction. Whatâ€™s this mean for brand-customer relationships? Potential buyer decision-making can be quicker and less fraught with apprehension. Notice the clickable sound-bites over the artists' heads where they introduce themselves? And the music-note icon that lets you play their music directly in the 360? We also added streamlined integration of captions, hyperlinks, and event information, so that people can more directly access the artists' music alongside sponsor information. Imagine: a brewery could feature, on their website, and on social media, 360Â° tours of the farms where their ingredients are sourced, 360Â° photos or videos of their kitchens, bottling factories, executives offices, sweating employees working hard mashing malt, and more. Little things like seeing beer being brewed in large copper vats can become a part of peoples' experiences online. In turn, this generates a sense of FOMO and encourages people to come visit the brewery in person. 360s are great for spaces and vistas, for landscapes, for cafÃ©s, for skylines, and even showing off art studios. Artists are also using 360Â° virtual spaces for animated designs, like cartoons. Check out this phenomenal take on Star Wars by artist Matthew Gallman. VR content and 360Â° photos are not just a fad. In an industry report released by Social Media Examiner, statistics overwhelmingly pointed to the increases in spending and resources on interactive content. 360Â° interactive content will soon be a common & multi-purpose tool for content marketers, artists, activists, promoters, and many others alike. This is not about jumping on the bandwagon. This is about exploration and the discovery of something worthwhile. Will 360Â° media will not be the silver bullet panacea cure-all for your business? Probably not. But it will help you to engage more authentically with your audience, to provide memorable & unique experiences for people, and to increase reach while seeing huge improvements on ROI, CTRs, and more, all for the same amount of ad-spend. Incorporation of interactive advertising and 360Â° virtual media into brands already are seeing vast successes. Event promoters are selling more tickets, people are engaging more authentically online, artists are discovering new ways to express themselves, gaining more fans, and creating beautiful content that converts online. This is owed in part to the simple nature of 360Â° content being interactive. For businesses, marketers, and artists alike, this is a great opportunity to try something unique that is low risk and relatively inexpensive. Interested in getting started with 360Â° content? We're here to help. Contact us today for a free 15-minute phone consultation. Andrew Cheek is the Head Writer and Content Coordinator for Beaumonde. He graduated from NC State University and is in process of polishing the manuscript for his childrenâ€™s novella. With a background in literature and film, and a taste for half-marathons, Andrewâ€™s inspirations range from Virginia Woolf to Wes Anderson to his Adidas running shoes. You can find Andrew on Twitter and LinkedIn.